In case you’re not following the current brouhaha involving the NFL and its player protesters who are refusing to stand for the national anthem — and I don’t blame you if you’re not following this deranged drama — it is now becoming apparent that the real act of courage and defiance in our twisted “progressive” society is standing for the national anthem. Protesting against America takes no courage at all these days, and every NFL player who takes a knee and refuses to stand for the national anthem is praised and celebrated by the left-wing media and its deranged, anti-American talking heads. Engaging in a “protest” that earns endless heaps of praise from the America-hating Left is no special accomplishment, in the same way that bashing President Trump takes no special courage, either. Everybody on the Left does it almost as a ritual, and the act is more about virtue signaling than any real protest. What takes real courage these days is to take a stand for your nation. The NFL Steelers player Alejandro Villanueva did that yesterday when he was the only member of his team to stand for the national anthem. Taking a stand and honoring your nation has now becoming the defining act of defiance against an insane, deranged, lunatic Left that despises freedom, despises America, despises police officers and despises elections. In other words, loving your country is now an act of defiance in our age of left-wing lunacy, intolerance, hatred and division driven by “identity politics” and the cultural poisoning of America. 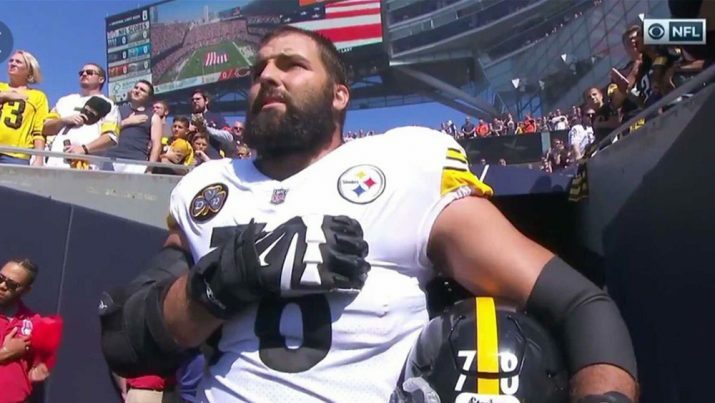 Villanueva is an ex-Army Ranger and now an instant celebrity of the true patriots and citizens who honor and respect their nation. While the mindless left-wing media attacks “nationalism” as a horrible thing — as if loving your country is somehow morally wrong — it’s people like Villanueva who remind the rest of us why America’s ideals are worth fighting for. Sales of his Jersey are reportedly skyrocketing everywhere. Isn’t it amazing that in a nation with so much liberty and opportunity where young football players can achieve fortune and fame based on the merit of their performance, regardless of the color of their skin, it is predominantly African-American players who absurdly claim they are being exploited by white team owners? These petulant, crybully players have forgotten what an opportunity it is to live in a land of such freedom and opportunity, where even an inner city black kid can rise to the top of a national sport and earn tens of millions of dollars in salary by literally playing a game. Have none of these players noticed that such things never happen in North Korea, Cuba or Communist China? What’s now obvious is that the NFL hates America. Many NFL players hate America. These crybullies despise everything that America stands for, including opportunity, economic mobility and merit-based rewards for performance. The NFL has collapsed into a deranged propaganda arm of the Antifa-loving Left, which thrives on lawlessness, hatred, intolerance and division. The NFL is now a propaganda machine for identity politics, a kind of twisted cultural poisoning that somehow seeks to gain power for Democrats by dividing America into a collection of “victim groups” that preach hatred toward everyone else. The division and hatred now spewing forth from the NFL — both from the players and obedient team owners — is so un-American that real Americans should no longer support the NFL in any form. It’s time for all Americans to boycott the NFL and teach this pathetic institution a whole new lesson on free market economics. Yes, they can take a knee, but we can also change the channel.